Ready to start something special? These copycat recipes from the 1950s are vintage fare at its finest. Take a trip back in time and enjoy some of the simplest, most comforting dishes around. 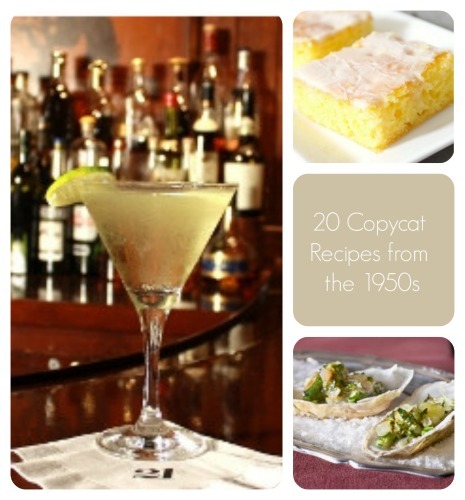 This collection of drink recipes, main dishes and desserts are old school but can be updated to modern day in a snap. The '50s were a time of lounge lizards and June Cleaver housewives. When you mix up a stiff drink recipe like Mad Men '50s Style Manhattan Cocktail, you'll be feeling ever better than the bee's knees. Don't be shy, mix yourself up something strong for the summer time and beyond. Think these recipes are good? Check out 20 Grandma's Favorite Recipes for even more great recipes! Do you think people counted calories all those years ago? We can't be sure, but it was a much more innocent and wholesome time and same goes for the easy dinner recipes. We're talking about simple gravy, cole slaw and chicken dinners...what's not to like? Take me back, I want to eat guilt free! Some of the great classic recipes from the 50s are my favorite recipes today. For one, I can't get enough of Chicken Pot Pie. 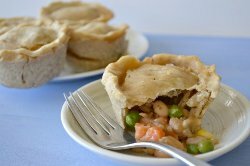 There's something so comforting about indulging in a delicious pastry, filled to the brim with chicken, carrots and peas. Like the desserts here? Check out this Old-Fashioned Jello Lemon Bars recipe for another vintage dessert idea! Now to the best part of the meal...dessert. I have to tell you something. I'm addicted to one easy dessert recipe in particular...Banana Pudding? Haven't tried it yet? You are missing out. It has the wonderful, light flavor of fresh bananas, mixed with the delightfully crunchy texture of Nilla wafers. Whenever I dive in, I imagine I'm sitting at a soda fountain with my friends. Malts are another one of those dessert recipes that are so fabulously old fashioned. I can't wait to give the Malt Cake a try. What's your favorite recipe from the 1950s? Be sure to let us know in the comments. I cannot resist the Knockoff Swedish Meatballs! They taste just like the one's at IKEA! I'm looking for a recipe for "Chicken Spaghetti" like my aunt made in the late 50's or early 60's. Had chicken, spaghetti, olives and I don't remember what else. Do you have a recipe for Texas Wieners? What is an Irish sweepstakes sandwich?? Well, I am seeing your inquiry exactly 1 year after your posted. 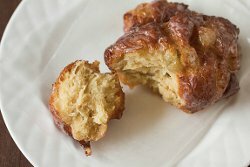 An site called RecipeCurio.com has the recipe. It was scanned from an old newspaper clipping, so I am guessing it is of the vintage you are seeking. ) I had never heard of Seafoam Pie before, so I looked it up. Here is the recipe as it appears on the site Seafoam Pie 1 (1 lb. 14 oz.) can fruit cocktail 1/4 cup sugar 1/2 teaspoon salt 1/3 cup cornstarch 1 1/2 cups fruit cocktail syrup 2 egg yolks 1 tablespoon grated lime rind 1/3 cup lime juice 2 tablespoons butter or margarine 2 drops green food coloring 2 egg whites 1/4 cup sugar 1 baked (9-inch) pie shell Drain canned fruit cocktail, reserving all syrup. Combine sugar, salt, cornstarch and fruit cocktail syrup in a small saucepan. Cook and stir until thickened and clear. Beat egg yolks slightly add slowly to hot mixture, beating constantly. Cook and stir one minute. Stir in lime rind, lime juice, butter and food coloring. Set aside to cool. Beat egg whites until stiff. Gradually add 1/4 cup sugar, beating to a stiff meringue. Fold into cooled lime mixture. Then fold in well-drained canned fruit cocktail. Heap lightly into baked pie shell. Chill thoroughly before serving. Makes 1 (9-inch) pie. In grade school in the 50's, every Wednesday we got to buy our lunch because it was Irish Sweepstakes (sandwiches). When we moved, we found out that wasn't something available and were so disappointed. Luckily my mom got the recipe from an old neighbor, so we could make it at home. They were good, just not as good as the ones from the school cafeteria (go figure!). What is an Irish sweepstakes sandwich??? In the fifties I used to go to the Artic Circle for a burger. They had a special sauce that was really different, Now they don't know what I am talking about. My thought is that maybe it was mayonnaise with some pickle juice for thinning. Anyway thought I would try it that way to see if it works. I would love it if some one had the fudge recipe that was on the Hersheys cocoa can in those years!! It seems that that recipe. V Can not be found on any of the sites I have been on and that is saying most all sites! Did you check on the Hershey's website? I grew up in the 50's and I think I have that fudge recipe. We used to call it camp fudge, as we took the ingredients with us when we went camping in the woods of Oregon. Always brought fellow campers over to our site to see what smelled so good. Don't know how to get it to you except on here so I will watch to see if you respond. Marcia L.
this mayonnaise cake is one of the OLDEST recipes for a chocolate and the OLDEST form of spice cake is called--tomato soup cake----both a very good. Chocolate mayonnaise cake was a breeze to make and very moist. However, Mom used to make it with mayonnaise not miracle whip and the original recipe called for Mayonnaise. The shortcut works because May. has eggs, oil, and several ingredients in it that you would have to add separately if you didn't use the shortcut. With four kids Mom said it was a great time saver, and I treated my family to this many times over the years. A nice simple cake, also coffee can be added in place of water if you want more of a mocha flavor. White or chocolate frosting. It was a big winner in the Betty Crocker or Pillsbury bake off contest in the 50's. this is from all recipes.com Add a Photo Pro Member(Learn more about Pro) READY IN50 mins Salad Dressing Chocolate Cake Read Reviews (15) 5 . "A cake that uses creamy salad dressing, who would have thought?!" ynathan85 . Back Next + Recipe Box + Shopping List + Menu Email Print Ingredients Edit and Save Watch video tips and tricks Fabulous Fudge Chocolate Cake Fabulous Fudge Chocolate Cake Too Much Chocolate Cake Too Much Chocolate Cake Original recipe makes 1 - 9x13 inch cake Change Servings 2 cups all-purpose flour 1 cup white sugar 2 teaspoons baking soda 1 teaspoon vanilla extract 1/4 cup unsweetened cocoa powder 1 cup creamy salad dressing (such as Miracle Whip) 1 cup lukewarm water Check All Add to Shopping List . Directions 1.Preheat an oven to 350 degrees F (175 degrees C). Grease a 9x13 inch baking dish. 2.Mix flour, sugar, baking soda, vanilla extract, cocoa powder, creamy salad dressing, and water in a large bowl. Pour into the greased baking dish. 3.Bake in the preheated oven until a toothpick inserted into the center comes out clean, about 30 minutes. Cool in the pans for 10 minutes before removing to cool completely on a wire rack.